The contemporary world is characterised by complexity and rapid change, affecting also the profession of an interior architect. Our programme is based on the principle that a set of design skills, in the narrow sense of the term, is not sufficient for interior architects/spatial designers to be successful in their profession. They also need to understand the broader context and be able to adjust their solutions to the changing situations. The first, so-called ‘hi-tech’ axis deals with the interaction between spaces and people, and the ways high technology and smart materials help improve that interaction. The second, so-called ‘low-tech’ axis is based on the notion that if we have good knowledge of our surrounding broader contexts, such as climate, nature, economy and culture, and their interrelationship, then rich imagination and primitive materials are all we need to create fresh quality spaces. During the first academic year, students will be participating in the projects on both axes to an equal extent. The second academic year will be dedicated to the master’s project. With the entire process, we are creating opportunities for students to find and train their personal creative expression. The overall objective of the Master’s curriculum is to prepare an independent creative person, who is able to create personalised three-dimensional environments, combining architecture, design, art and technology into a coherent whole and lead the implementation of their interior architecture projects. The curriculum provides skills to analyse critically, develop, and experiment with the different aspects of the creation of spatial environment and helps to develop a personal creative approach. It focuses on providing in-depth theoretical knowledge and practical skills necessary for qualified professional work with the aim of preparing the students with skills to create interior architecture projects independently. Portfolio – The portfolio in the PDF format should be included in the application documentation. The portfolio should include at least five design projects which, depending the nature of the project, feature drawings, renderings, diagrams, photographs and explanatory text. Essay of possible MA thesis topics. The essay should not exceed 2000 characters and should be included in PDF format in the application documentation. Visual material could be added if necessary. Short video – The purpose of the video is to allow the candidates to present their mission as a designer as well as to define the addressee of their master project. Admission to our international MA programme in Making Space will open again in 1st of March 2019. Meanwhile, we invite you to sign up for our department’s newsletter, and we promise to send you reminders once admission is open and information about the exams. Leave your details here. EKA interior architecture student student Karolin Kull was awarded the Vello Asi Student Award at the at the Estonian Architecture Awards ceremony on 6 December. 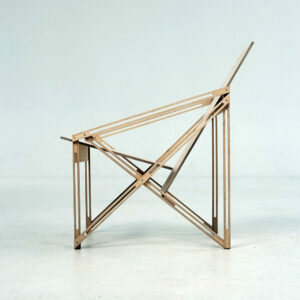 Image: Karolin Kull’s 1st year chair studio final work, image by Päär Keedus. Tutors: Ilkka Suppanen, Martin Relander.